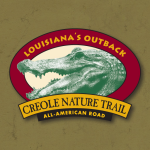 To help plan your trip and make the most of your visit, download the free Creole Nature Trail personal tour app. A map of the Creole Nature Trail is below, and is also located in the Creole Nature Trail brochure available for download or, if you prefer, request a hard copy to be mailed to you. Louisiana&apos;s Creole Nature Trail All-American Road is a hands-on opportunity to experience one of America&apos;s untamed natural wonders near Lake Charles, LA. Feel inspired and amazed as the Creole Nature Trail All-American Road leads you into the unsurpassed splendor of Louisiana&apos;s renowned coastal wetlands and along the natural Gulf of Mexico beaches. App available in English, French, Spanish, German, Mandarin Chinese and Japanese. Visiting from outside the USA? We highly recommend you download the app and all content before you leave home. Once you arrive you can turn off WiFi, turn on location and start the app. The GPS on your device will determine where you are on the trail and indicate when you should push “play” to view audio/video content.